I remember the first time I heard about dirty electricity. It just sounded like ‘another thing’ to worry about. What I wanted was just the opposite. I didn’t want to have deal with anything more than I was already dealing with. But, I had an open mind and I had a willingness to take action. So I bought a Graham Stetzer (GS) meter and I tested. It was a good job I did because it turned out there was dirty electricity in my home. So I installed some dirty electricity filters. The filters didn’t cure my electrical sensitivity but they did alleviate my symptoms. Other people have experienced similar benefits. Some people feel worse when filters are introduced into their home. A while ago Shaun at Electrahealth, who sells these filters and GS meters, contacted me asking if I’d survey my list to ask people what they thought of the dirty electricity filters. We need more research on dirty electricity so I thought this was an excellent initiative. The final question and results you can see above. We have the raw survey results/responses, but I do not personally (nor anyone else employed by me) have the ability to analyze them to see if there is any correlation between the response in question 3 and the response in question 4. I would be happy to send the raw results to anyone who would like to look at this. I would suspect that those who installed them as recommended or installed more of them in more locations had better results. But the data needs to be analyzed to confirm that. What Does This Survey Tell Us? 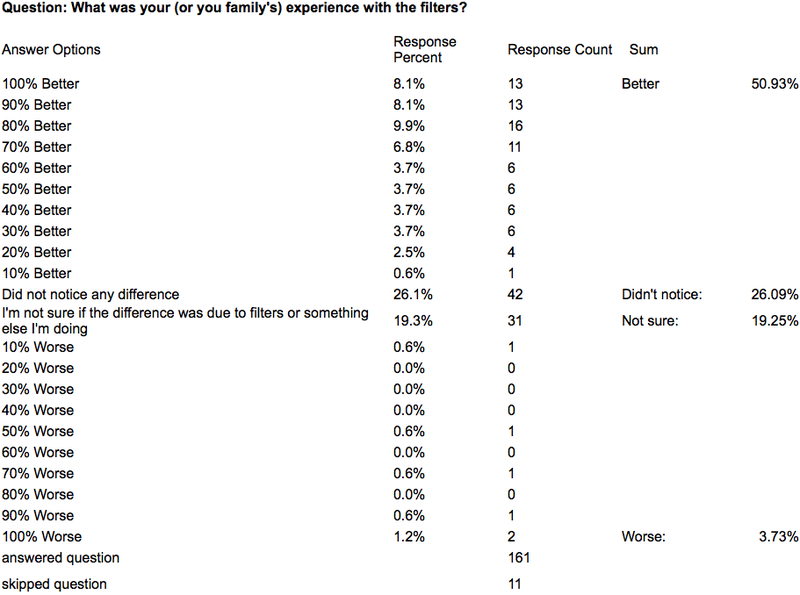 1. a majority of people (50.93%) reported a positive experience from using the Graham-Stetzer filters. This tells us that Graham-Stetzer filters are not for everyone. But it also tells us that only a small percentage of people felt worse after installing the filters. Admittedly, this is a small survey sample but these results do tie in with the experiences that people have been reporting (see this article). There are lots of things you can do to mitigate your exposure to EMFs and installing dirty electricity filters is one of them. If you’re still sitting on the fence about dirty electricity you too need to keep an open mind and you need to be willing to take action. The starting point before you buy any filters is to buy a dirty electricity (GS) meter to establish what the dirty electricity levels are in your home. Thanks to Shaun for sharing this information. You can buy a dirty electricity meter from ElectraHealth. Great article, thanking for existing and working so much for the rest of us. I use the filters and also sell them. These filters emit some levels of ELF and EMI radiation (both Electric and magnetic fields). I suggest to all my costumers to keep 1 meter of safety distance. For people how are extremely sensitive to ELF electric fields I suggest to do without. In any case, as always, it is important to reduce the use of Dirty Electricity sources before using the filters. meaning stop using CFLs, disconnect power converters and electronic equipment from the power line when not in use. It is also important to measure the Dirty Electricity and make some steps to reduce it, again before using filters. I see people that the filters helps them a lot. They help me as well. On the other hand I see people who feel worse with the filters. If the company that makes these filters would try to reduce the ELF+EMI electric fields emitted from the filters, I think more people will be bale to use them. I found that my residential solar system dramatically increased the reading on the GS meter–produced alot of dirty electricity. This survey is more than biased. That is my first comment. I was going to take the survey. So biased I did not. More importantly, here is my experience with and thoughts about the GS filters: The Stetzer filters are not, in my experience, a good solution, although some say they have been helped by them. This is my experience with Stetzer filters: They have a very strong magnetic field that goes out into the room. I can feel the magnetic field from these “filters” and I can hear a very high-pitched scream coming from them. Again, these high-pitched screams are what people complain about from dirty electricity with smart meters and the radio-off smart meter. You are using Stetzer filters to prevent this very phenomenon (dirty electricity), yet they are in fact creating dirty electricity because they are a mini-transformer. Yes, the reading on the Stetzer meter goes down, but that is probably for 2 reasons: (1) The filters are getting rid of the narrow band of frequencies that meter captures. (2) The Stetzer meter, while a useful tool for judging the amount of dirty electricity going through your wiring (within the band of frequencies it captures), does not measure the ambient magnetic field–that is, the magnetic field in the room. If you were to measure that, I suspect you would find that the filters are creating quite a field. There are ways to measure this ambient field. See the book by Karl Riley, Tracing EMFs in Home Wiring. We use the filters as recommended, took the survey and would elaborate: The electric fields from our telephone answering machine’s plug and a Stetzer meter 2 outlets away both are negligible (measured with Trifield 100XE). The magnetic field measures 3 milligauss at 12 inches from the telephone answer machine’s plug and goes above 100 milligauss within 6 inches. The magnetic field measures 3 milligauss at 1 inch from the Stetzer meter. In other words, the magnetic field created by the telephone answering machine plug is much much stronger. I’ve had them for a few years now – maybe 12 to 15 G-S filters scattered around my house. And I newly feel like crippled crap since my neighbourhood began being microwaved with smart meters (though I don’t have one ON my house), AND since I now have numerous Wifi services wafting through, from neighbouring homes. Hi Lloyd, thank you for providing this service. I was perusing your site yesterday and came upon a video you had posted; film called Whistleblower,featuring Dr. Carlo. Later in that short film, the filmmaker also featured a company in Bavaria, Memon that ‘seems’??? to have come up with a solution. Are you familiar with them and if so, have u tested any of their products? I think that what you are doing with website and talks is great, we desperately need to raise awareness of all types of electro-pollution. I am the New Zealand agent for Stetzer products and in general I have very good success with them. I have an oscilloscope with a special 50 Hz filter from Dave Stetzer that allows me to show people the dirty electricity after the 50Hz power has been filtered out and also how very effective the filters are at reducing it. A suggestion that I would make to the people who either have a reaction to the filters or notice increased magnetic fields in their homes is that the filters may be indicating a possible fault or slightly incorrect connection on their wiring. If there is a poor connection on the neutral wire (the black return wire in my part of the world), a connection not up to code or some other fault with the wiring then you can measure strange fields or possibly other issues. In the very unusual instance where a customer reports feeling unwell around the filters the very first thing I go looking for are elevated magnetic fields and a good electrician to try to find the fault if the fields are elevated. It might be surprising to hear that even with a qualified electrician they do make mistakes and there can be minor faults or issues like a screw at a connector not tightened sufficiently to make a good connection or a wire connected incorrectly. We are all individual and have our own response to the frequencies around us, and a very small number of people may have a reaction to the filters but in the vast majority of cases I find that reducing dirty electricity in an environment has distinct benefits for the occupants. On many occasions the greater sense of calmness has been commented on once the dirty electricity has been reduced, especially where the readings were very high.